This is a rare example in the UK of a Dutch chamber organ. Its recorded history only goes back to 1956, though the internal markings are Dutch and the style of manufacture is the same as in other historic Dutch chamber organs. The tonal and mechanical parts may have been made by one of the most notable Dutch chamber organ builders. 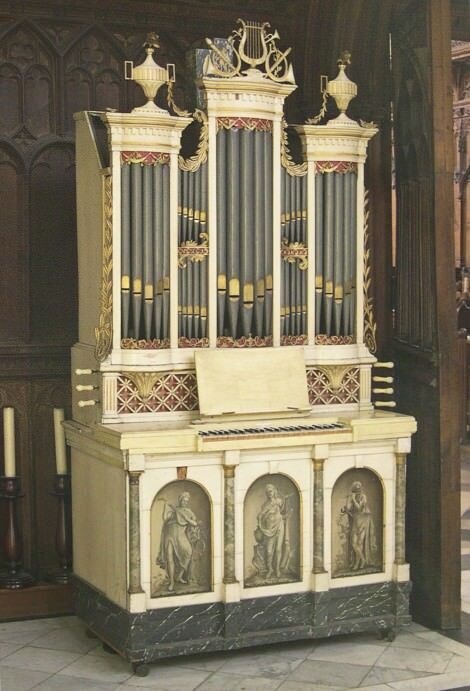 The ornamental pipe front is the only surviving Dutch chamber organ front which imitates a church organ. We don’t know why it came to England, but its musical significance has been enhanced by its acquisition by a pioneer of the Early Music movement, Thurstan Dart, and its use with instrumental ensembles in the 1950s and 1960s. The case, soundboard, bellows and pipework were made in ca1760 in Holland, perhaps by Hendrik Hermanus Hess (1735-1794) in Gouda. In ca1800 a new pipe front was added to the case, perhaps in Dordrecht. The dummy metal front pipes are very similar in make to the inside pipes, which suggests a successor worksop, perhaps Pieter Johannes Geerkens (1757-1833) . In the mid 19 th century the organ was restored using letters from the Dordrecht tax office to seal the bar frame. In the early 20 th century the organ came to England. It was found by Thurston Dart in a cottage in Milton just north of Cambridge in 1956 and restored by N P Mander. In 1971 Thurston Dart left the organ to the Oxford University faculty of Music. It was kept in the Holywell Music Room till 1985. In 2004 it was moved from storage to New College Chapel and repaired. In 2009 the organ was sold to Christopher Hogwood and restored by Dominic Gwynn. These names are those on the ivory stop labels supplied by Mander in 1956. The lowest pipe of the Prestant 8vt is marked ‘ prest 8 ‘, the Prestant 4vt is marked ‘ Fluijt 4v ‘, the Octav 2vt is marked ‘ octaav 2v ‘. The pipe metal has a high lead content and is thick and soft, unusual because it was evidently thicknessed between metal rollers and not by plane or scraper. The Holpijp and Fluit are stopped pipes made of oak, unusual in Dutch church organs but common in chamber organs. The speech and tone are characteristic, relatively fluty compared with classical English pipework. At some stage a tremulant had been removed, perhaps as late as 1956. The key compass is C-d³ (51 notes) divided at bº/c¹. The pitch is now A440 but was originally about half a semitone lower. The tuning is now Werkmeister III, but may originally have been a modified meantone. The metal pipes are now tuned with slides so that the tuning system can be altered (retained at this restoration because the pipe metal is so soft). The wind chest was restored, for the first time since the middle of the 19 th century, a much needed repair. The wind is provided with an electric blower only and the original feeder and foot pedal removed in 1956, presumably because the organ was provided with castors. A new blower was placed inside the case at this restoration, which meant that the foot pedal was not replaced. The case is 2330mm tall and the bottom case is 1370mm wide and 720mm deep.